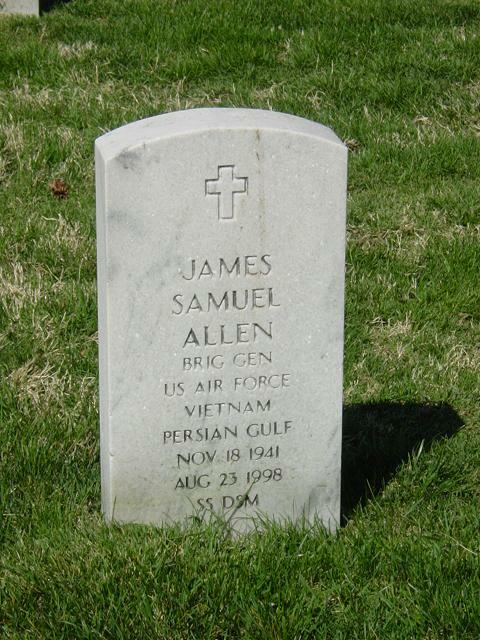 Retired Air Force Brigadier General James Samuel Allen, 56, died in a late night fire on August 22, 1998 at his South Arlington, Virginia, town house at 1704 S. 23rd Street. Fire officials said the blaze apparently started in the second-floor kitchen, sending smoke into his third-floor bedroom, where Allen was found. Neighbors reported the fire at 11:49 p.m., and it was quickly extinguished. But attempts to revive Allen were unsuccessful. The cause of the fire is under investigation. Fire officials said on August 25, 1998, that improperly discarded smoking materials apparently started the fire. Brigadier General James S. Allen was assistant chief of staff for operations, Headquarters Allied Forces Central Europe. General Allen was born in Cambridge, Massachusetts, in 1941, and graduated from North Cambridge Catholic High School in 1959. He received a bachelor's degree from Boston University in 1964 and a master's degree in business administration from Auburn University in 1979. The General completed Industrial College of the Armed Forces in 1971, the program for management development at Harvard Graduate School of Business in 1973 and Air War College in 1979. The General received his commission through the Air Force Reserve Officer Training Corps program at Boston University in June 1964. He completed pilot training at Reese Air Force Base, Texas, in June 1965 and then attended advanced flying training in F-100s at Luke Air Force Base, Arizona. In May 1966 he transferred to the 510th Tactical Fighter Squadron, Bien Hoa Air Base, Republic of Vietnam, as an F-100 pilot. In June 1967 he was assigned as a pilot to the 493rd Tactical Fighter Squadron, Royal Air Force Station Lakenheath, England. The general then became a standardization and evaluation flight examiner with the 48th Tactical Fighter Wing. He transferred to Headquarters 3rd Air Force, Royal Air Force Station South Ruislip, England, as a member of the tactical evaluation team in June 1970. Upon returning to the United States in June 1971, he was assigned to the Office of the Deputy Chief of Staff, Manpower and Personnel, Headquarters U.S. Air Force, Washington, D.C., where he served in colonel assignments. After completing the program for management development in August 1973, he was assigned to the 4th Tactical Fighter Squadron, Udorn Royal Thai Air Force Base, Thailand, as assistant operations officer. In June 1974 he returned to Luke, where he attended Central Instructor School and was assigned as assistant operations officer of the 426th Tactical Fighter Training Squadron. He became a squadron operations officer in October 1975. General Allen was commander of the 34th Tactical Fighter Squadron, Hill Air Force Base, Utah, from April 1976 until April 1977, when he became commander of the 4th Tactical Fighter Squadron, also at Hill. Upon completion of Air War College in June 1979, he was assigned to the Air Staff as deputy chief, Europe/NATO Division, Directorate for Plans and Policy, Office of the Deputy Chief of Staff, Plans and Operations, Air Force headquarters. In April 1980 he became chief of the Europe/NATO Division. From April 1981 to May 1982 he was an Air Force planner. The general then was assigned as commander of the 4450th Tactical Group, Nellis Air Force Base, Nevada. In July 1984 he returned to the Office of the Deputy Chief of Staff, Plans and Operations, as director for Joint and national security matters. He became military assistant to the secretary of the Air Force, Washington, D.C., in May 1986. In January 1988 he assumed command of the 833rd Air Division, Holloman Air Force Base, New Mexico. He assumed his latest position in September 1989. The General is a command pilot with more than 2,800 flying hours in fighter-attack aircraft, including the F-100, F-4, A-7, F-117 and F-15. He flew more than 375 combat missions, logging more than 400 flying hours. His military awards and decorations include the Silver Star, Legion of Merit with two oak leaf clusters, Distinguished Flying Cross, Meritorious Service Medal with two oak leaf clusters, Air Medal with 15 oak leaf clusters, Air Force Commendation Medal with oak leaf cluster, Presidential Unit Citation, Air Force Outstanding Unit Award, Combat Readiness Medal, National Defense Service Medal, Vietnam Service Medal with three service stars, Air Force Longevity Service Award Ribbon with four oak leaf clusters, Small Arms Expert Marksmanship Ribbon, Republic of Vietnam Gallantry Cross with five service stars, Republic of Vietnam Gallantry Cross with Palm, and Republic of Vietnam Campaign Medal. He was promoted to Brigadier General Aug. 1, 1986, with same date of rank. Georgia Tech is mourning the loss of a valued colleague who advanced the Institute’s interests inside the Beltway. Brigadier General James S. Allen (USAF Ret. ), 56, died August 23 following a fire at his Arlington, Virginia, townhome. As director of Washington Operations for the Georgia Tech Research Institute (GTRI), Allen had represented Georgia Tech’s interests in the Washington, D.C. community since 1993. Allen was instrumental in helping GTRI build international defense work. He also identified new opportunities and helped develop many new programs for GTRI throughout DoD. Allen brought to Tech extensive experience in military operations and Air Force tactical work developed during his 28-year Air Force career. From 1982 to 1985, he moved the U.S. Air Force’s Stealth Fighter program from development to full operations, said Major General George B. Harrison (USAF Ret. ), GTRI’s director of Research Operations. “Jim was the catalyst for bringing this totally new capability to the DoD,” Harrison said. Before joining GTRI, Allen was Air Force assistant chief of staff for operations for all NATO Forces in Central Europe. He began his career in 1964 as a fighter pilot, logging more than 3,000 hours of flying experience in F-15, F-117,A-7, F-4 and F-100 aircraft. Allen also was a commercial pilot. Reedy remembers Allen as focused and conscientious, as a person who always followed up, was aggressive pursuing opportunities, and faced problems rather than avoiding them. Harrison appreciated Allen’s enthusiasm, friendship, dedication, vitality and positive attitude. Allen is survived by his wife, MaryJane; three children, David, Amanda and Andrea; one stepdaughter, Raquel Snyder; and one granddaughter. A Mass of Christian Burial will be offered at the Ft. Myer Chapel on Sept. 22 at 12:45 p.m. Interment, with full military honors, will be at Arlington National Cemetery. In lieu of flowers, memorials may be made to the Air Force Aid Society.